Introduction - Some have described the so-called Olivet Discourse (because it was spoken on the Mount of Olives) in Matthew 24 as the most difficult section to interpret in the entire Gospel of Matthew. While I would agree it is undoubtedly the most contentious section, it is not necessarily the most difficult to interpret. If one applies the principle of letting the plain sense of the text simply say what it says without superimposing any preconceived bias or system of theology (be it dispensational, covenant, reformed, preterist, etc), it is amazing how understandable the passage becomes. In short, one needs to read Matthew 24-25 literally. (Note: I did NOT say "dispensationally!") Literal is defined as "taking words in their usual, natural or most basic sense as opposed to reading them in figurative, metaphorical, mystical or allegorical sense." That is the approach taken in these notes - to come to the Scriptures as a little child, totally dependent on our Teacher, the Holy Spirit, seeking to not add to the text or look for any hidden meanings (cf warnings against this mode of interpretation - Dt 4:2; 12:32; Pr. 30:6; Jer. 26:2, 2Ti 2:15, Rev 22:18-19). In short, if the plain sense of the text makes good sense in context, one should seek to make no other sense out of it lest it end up making no sense (nonsense)! In the interest of full disclosure, it should be emphasized that the notes you are reading diligently seek to avoid anything that might be construed as preterist interpretation (See also Preterism - Wikipedia). The major danger of this mode of interpretation is that it interprets unfulfilled prophecies in such a way as to effectively relegate them to the past, and in so doing the import of what God's Spirit is seeking to teach is lost on both present and future generations, especially those who will be alive when these prophecies literally begin to unfold! Wikipedia has a very interesting statement in the article on the Olivet Discourse - "In each of the three gospel accounts, the sermon contains a number of statements which at first glance seem predictive of future events. However, modern Christian interpretation diverges as to the meaning of the additional topics in the discourse." I do not know the author of this article but it seems that when they allowed the text to speak for itself, devoid of personal bias or one's particular system of interpretation, the text seemed to be "predictive of future events!" Would it be that everyone who reads this great sermon, would read "at first glance" as it were! I cannot emphasize too strongly, the moment the reader begins to jettison an unbiased, plain sense reading of the text, the ability to interpret the words of Jesus literally becomes "colored" and is swayed by the "experts" rather than the by the common sense of the text! To begin with, we must study this discourse in the light of the rest of Scripture, especially the Book of Daniel. The prophetic Scriptures harmonize if we consider all that God has revealed. Ed comment: If you are interested in prophecy, I would strongly suggest first doing a serious, in depth study of the book of Daniel (studying it by carrying out your own careful observations and not by just reading commentaries on Daniel many of which do not interpret the text literally) which will give you a firm foundation for interpretation of the NT prophetic sections such as the Olivet Discourse and the Revelation. As a corollary, if you study the Olivet Discourse without an understanding of "God's Plan for the Ages" as clearly laid out in a literal reading of Daniel, Jesus' words will be difficult to understand in the context of God's overall plan! You will also be dependent on the opinions of the commentaries and the author's general approach to interpretation, which often is not literal! I would add that one can simply not understand the book of the Revelation unless one has first studied the parallel prophetic passages in Daniel. The best course I know for studying the Book of Daniel is Precept Ministries two part study which I highly recommend = Daniel 1-6 - Living Out a Biblical Worldview and Daniel 7-12 -Gaining Understanding of the Time of the End. You could then supplement your study with the comments I have written based on over 30 years of studying the Book of Daniel from a literalistic perspective - see Daniel Commentary Verse by Verse. Notice the recommended order - first your personal study under the teaching ministry of the Holy Spirit and second the commentary, for only then will you be able to "comment on the commentary" including the one I have compiled! Second, we must see the practical application of the discourse. Jesus did not preach this sermon to satisfy the curiosity of His disciples, or even to straighten out their confused thinking. At least four times He said "Take heed!" (Mark 13:5, 9, 23, 33) (Ed: cf similar warnings in Mt 24:4, 23, 26) and He closed the address with the admonition, "Watch!" While studying this address can help us better understand future events, we must not make the mistake of setting dates! (Mark 13:32) (Ed: cf Mt 24:36). So as we study Jesus' Olivet Discourse it is important to let the text say what it says, reading it literally, keeping context king and seeking where possible to allow Scripture to explain Scripture. On what day of "Holy Week" did this discourse take place? Tuesday Evening (cp Mk 11:19, See note on "Holy Tuesday", cf Passion Week or Holy Week) (Note: MacArthur thinks it was Wednesday evening because he dates the Triumphal Entry to Monday, not Sunday). Jesus came out from the Temple - "All the discourses since Mt 21:23 have been in the Temple courts." (A T Robertson) This final departure of Jesus from the Temple marked the end of His public ministry! Mark 13:1 has a similar phrase "He was going out" (present tense) picturing Him in the act of leaving. The statement about Jesus' leaving the Temple is not found in Luke 21:1-6 which at least raises the possibility that the latter discourse was delivered in the Temple complex. However most commentators consider Luke 21 as part of Jesus' classic Olivet Discourse. Was going away - The imperfect tense (continuous action) gives us a vivid description of Jesus. One can picture Him as He keeps on walking away from the Temple for the last time. Jesus (2424)(Iesous) is transliteration of the Greek Iesous, which in turn is the transliteration of the Hebrew name Jehoshua (Yehoshua) or Jeshua (Yeshua) which mean Jehovah is help or Jehovah is salvation. Stated another way the Greek Iesous corresponds to the OT Jehoshua (Yehoshua) which is contracted as Jeshua (Yeshua). NET Note on Jesus - The Greek form of the name Iēsous, which was translated into Latin as Jesus, is the same as the Hebrew Yeshua (Joshua), which means "Yahweh saves" (Yahweh is typically rendered as "LORD" in the OT). His disciples came up to point out the Temple buildings to Him - Mark says "one of His disciples" (Mk 13:1) apparently acted as spokesman for the group and directed Jesus' attention to the magnificent structures. The Synoptic Gospels do not state specifically why they did this. However keeping the context in mind, they may have been motivated by the fact that Jesus had just stated "Behold, your house (the Temple) is being left to you desolate!" (Mt 23:38 - discussed more fully in comments below on Mt 24:3) Luke 21:5 says "some were talking about the Temple, that it was adorned with beautiful stones and votive gifts." (Lk 21:5) Aren't we all like the disciples, awe struck by the beauty of man made edifices, but sadly often minimizing the super-human Beautiful One Himself! 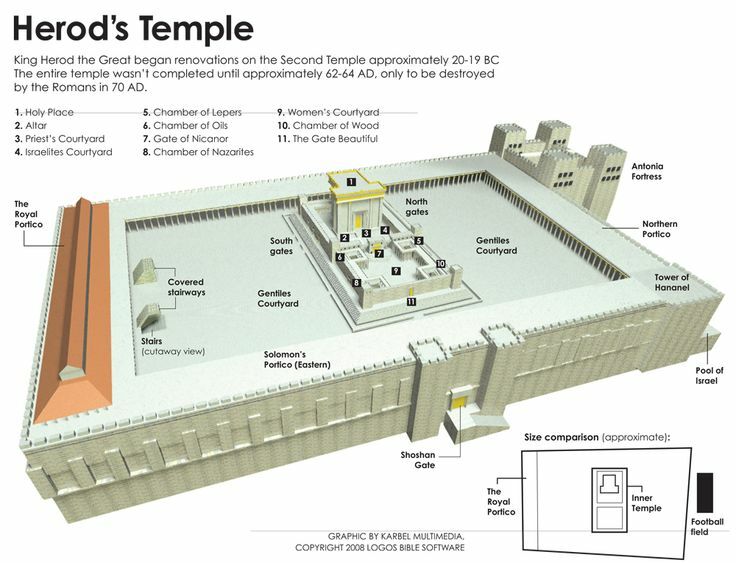 The Temple (See Herod's Temple) buildings - Construction of the Temple had begun nearly 50 years earlier under the direction of Herod the Great and would still be ongoing 40 years later when it was utterly destroyed! (cf Eccl 1:2-3!) The summit of Mount Zion had been dug away to leave a plateau of 1,000 feet square. At the far end of it was the Temple itself (naos). It was built of white marble plated with gold, and it shone in the sun so that a man could scarcely bear to look at it. Between the Lower City and the Temple Mount lay the Tyropoeon Valley, and across this valley stretched a colossal bridge. Its arches had a span of 41 1/2 feet, and its spring stones were 24 feet long by 6 inches thick. The Temple area was surrounded by great porches, Solomon's Porticos and the Royal Porch (Acts 3:11-12). These porches were upheld by pillars, cut out of solid blocks of marble in one piece. They were 37 1/2 feet high, and of such a thickness that three men linked together could scarcely put their arms round them. At the corners of the Temple angle stones have been found which measure from 20 to 40 feet in length, and which weigh more than 100 tons. How they were ever cut and placed in position is one of the mysteries of ancient engineering. Little wonder that these Galilean fishermen looked and directed Jesus' attention to them. Others are like Herod who focused on the trappings of "religion" at the expense of a relationship with the Righteous One!. Tacitus-Book V Chapter 8 described the Temple as "enormous riches"
The Temple buildings - The disciples focused on the exterior of the Temple. Jesus focusing on the real meaning of the Temple, which was supposed to symbolize the presence of God. And of course Jesus knew that not only was much (most) of the religious activity associated with the Temple a sham, He also knew that the religious leaders would soon reject Him as the God that the Temple symbolized. Temple (2411)(hieron) referred to a building which was set apart and dedicated to the worship and service of the gods. In the NT hieron was used to designate the entire complex, the entire sacred enclosure, with its porticos, courts, and other subordinate buildings. The Greek word Naos referred to the Temple proper, including the inner sanctuary, composed of the outer room, the Holy of Holies and the innermost Holy Place. When our Lord taught in the Temple, He taught in the hieron, in one of the temple porches. He expelled the money-changers from the hieron, the court of the Gentiles. When the veil of the Temple was rent at the time of the death of our Lord (Mt 27:52, cp Heb 10:19-22-note), it was the veil of the naos, the curtain separating the Holy of Holies from the Holy Place. When Zacharias entered the Temple to burn incense (Lk 1:9), he entered the naos, the Holy Place where the altar of incense stood while the multitude were in prayer outside in the hieron the temple complex (Lk 1:10). Luke 19:44 and they will level you to the ground and your children within you, and they will not leave in you one stone upon another, because you did not recognize the time of your visitation." Mark 13:2 And Jesus said to him ("one of His disciples" - Mk 13:1), "Do you see these great buildings? Not one stone will be left upon another which will not be torn down." Luke 21:6 "As for these things which you are looking at, the days will come in which there will not be left one stone upon another which will not be torn down." Do you not see all these things? - In Mark 13:2 Jesus asked "Do you see these great buildings" (cf "it was adorned with beautiful stones and votive gifts" - Lk 21:50) thus acknowledging the magnificence of the Temple complex. Truly (Amen) (281)(amen) when used by Jesus before a saying was to stress the truth and validity of the sayings by His own acknowledgment of them. The idea is "I solemnly assure you." Not one stone here will be left upon another - Up to this time during the day (it was probably toward Tuesday evening now - cf Mk 11:19) Jesus had been teaching (cf Mk 11:20-12:44), acting as the "forth teller" but now He switches to "foreteller" uttering a dramatic prophecy that would soon come to pass. Jesus predicted the complete and utter destruction of the Temple, a prophecy that was fulfilled in 70AD. Jesus had foretold metaphorically of the destruction of the "Temple" of His body (Jn 2:19, Mk 14:58, Acts 6:14), but now He spoke of a literal destruction of the holy Temple, not His holy body. Although some of the stones which were set in place by Herod the Great in his expansion of the Temple complex are still visible on the southeast corner of the Temple Mount, that does not at all invalidate the literal fulfillment of Jesus' prophecy, because He was referring to the stones of the actual Temple of which not a stone remains left upon another. Not one stone...upon another (Literally = "stone upon stone") - In Matthew's version Jesus uses a strong double negative (ou me) signifying absolutely not one stone of the Temple would remain intact. His negative emphasis is even stronger in Mark 13:2 for He uses the double negative twice - "Absolutely not even one stone will be left upon another which will absolutely not be torn down." His prediction was stated about as dogmatically as it could be stated in the original Greek! Prophecy is like a jigsaw puzzle and just as one is enabled to solve the puzzle by first finding the most obvious pieces (the corners), so too one is enabled to unravel a controversial chapter like Matthew 24 by finding the obvious pieces. And so we need to keep the context in mind and compare Scriptures that relate to the context. What was the context? What had Jesus just declared in Matthew 23:37-39? Comment: To what house does He refer? This is clearly a reference to their beloved Temple (and city of Jerusalem). In the Old Testament Daniel 9:26 (see commentary) had prophesied "after the sixty-two weeks (plus the 7 weeks = 69 weeks = 483 years) the Messiah would be cut off (the Crucifixion of Jesus - Hebrew word = karath = speaks of a violent death) and have nothing, and the people (Romans) of the prince who is to come (Antichrist) will destroy the city and the sanctuary. And its (Jerusalem's) end will come with a flood; even to the end there will be war; desolations are determined." As discussed above it may have been because Jesus pronounced this judgment on Jerusalem and the Temple that the astonished disciples immediately drew His attention to its beauty and magnificence. It is worth noting that almost 500 years earlier Daniel had foretold the Crucifixion of the Messiah and the desolation of Jerusalem by the Romans. But in the midst of wrath ("your house...left to you desolate") God remembers mercy, for He is a merciful (mercy filled) God! And so in Mt 23:39 Jesus gives a prophetic promise which begins with the word "until" which marks the time when Israel will bless the Messiah Who returns in the Name of the LORD at the end of this age. Why will they call Him "blessed" in the future and not at the time He walked among them? Most Jews rejected Jesus as the Messiah in His first advent (Jn 1:11), but when He returns, the Spirit of grace and supplication will be poured out on the Jews (Zech 12:10) and one-third will be saved (the "all Israel" of Ro 11:26-27, Zech 13:8-9). It is those saved Jewish people who will shout out Psalm 118:26 (where Mt 23:39 changes "one" to "He" and Lk 19:38 changes "one" to "the King" for at that time He will indeed be "King of kings and Lord of lords!" Amen! [Rev 19:16]). In summary even in Matthew 23:38-39, Jesus prophesied of the coming destruction of the House of God, the Temple, which occurred in 70AD. But He also prophesied about His future return as King of kings at the end of this age! Now as we read Mt 24:3 we can better understand why the disciples ask Him not only about the timing of the destruction of the Temple but also about His return at the end of the age. Comment: In Luke 19:42 the phrase "this day" might be better translated "the day" because the definitive article ("te" = the) precedes "day" (hemera) and marks it as a very specific, unique day. In context, "this day" is further described by Jesus as "the time of your visitation." What is unique about "this day" and "the time of your visitation." It was the very unique day when Jesus presented Himself to the Jews as their Messiah and King entering Jerusalem riding on a colt (Lk 19:35-38; cp Mt 21:7-9 "the donkey and the colt") as the Jews cried "Hosanna [Save Now] in the highest!" (Mt 21:9) They were crying for salvation (from Rome) but not for salvation (from sin) and so they missed their long promised Messiah. Jesus' is very clear that they should have "known in this day" that it was "the time of visitation." But is Jesus being unfair? How could they have known this specific day? Is there any place in the Old Testament Scriptures where God had foretold of this unique day? Since we know God is never unjust or unfair, we know that there was clearly a prophecy that foretold of "this day." That prophecy is found in the Seventy Weeks which were specifically "decreed for your people (Israel) and your holy city (Jerusalem)" (Da 9:24-27). That incredible prophecy foretold to the day when the Messiah would come into Jerusalem, but also foretold that He would be crucified and that Jerusalem would be left desolate, just as Jesus had predicted. Amplified While He was seated on the Mount of Olives, the disciples came to Him privately and said, Tell us, when will this take place, and what will be the sign of Your coming and of the end (the completion, the consummation) of the age? Darby And as he was sitting upon the mount of Olives the disciples came to him privately, saying, Tell us, when shall these things be, and what is the sign of thy coming and the completion of the age? KJV And as he sat upon the mount of Olives, the disciples came unto him privately, saying, Tell us, when shall these things be? and what shall be the sign of thy coming, and of the end of the world? NET As he was sitting on the Mount of Olives, his disciples came to him privately and said, "Tell us, when will these things happen? And what will be the sign of your coming and of the end of the age?" ESV As he sat on the Mount of Olives, the disciples came to him privately, saying, "Tell us, when will these things be, and what will be the sign of your coming and of the close of the age?" NIV As Jesus was sitting on the Mount of Olives, the disciples came to him privately. "Tell us," they said, "when will this happen, and what will be the sign of your coming and of the end of the age?" NLT Later, Jesus sat on the Mount of Olives. His disciples came to him privately and said, "Tell us, when will all this happen? What sign will signal your return and the end of the world? " The Mount of Olives - How apropos that Jesus' delivered this message giving details of the His glorious return (Mt 24:27-30). The disciples may have known the prophecy of in Zechariah 14:4-note - "And in that day His feet will stand on the Mount of Olives, which is in front of Jerusalem on the east; and the Mount of Olives will be split in its middle from east to west by a very large valley, so that half of the mountain will move toward the north and the other half toward the south." Not only would Jesus return to the Mount of Olives but He would soon ascend back to the Father from the Mount of Olives (Read Acts 1:9-11, 12-note). Before we go any farther it is important to understand what Jesus' disciples believed about the coming of the Messiah. The following summary is taken from John MacArthur's sermon (see this sermon for expansion of each of the following points) and much of his information is derived from the work of Emil Schurer (See Schurer's discussion of The Messianic Hope - Caveat - Note that I do not agree with all of Schurer's conclusions - e.g., he dates the writing of Daniel circa 164 BC four centuries later than it was actually penned by the prophet Daniel!). What this synopsis does help us understand is that the disciples were not looking for a "Second Coming" as we speak of it today. They were firmly convinced that Jesus was the long expected Jewish Messiah and that in their lifetime He would defeat Israel's enemies and set up His glorious kingdom of God in which Israel would once again be the most prominent nation in the world. Even after His death, burial and resurrection, the disciples still did not understand that Jesus had to leave and that there would be a long interval (at least 2000 years now) before He would return and accomplish the objectives outlined below. How do we know the disciples were still confused about the "timing"? Even after Jesus had spent 40 post-resurrection days speaking of the things concerning the Kingdom of God (Acts 1:3-note), they steadfastly continued to believe that Jesus was going to set up the Kingdom at that time. And so when they had come together, they were asking Him, saying, “Lord, is it at this time You are restoring the kingdom to Israel?” (Acts 1:6-note). Notice what Jesus did NOT SAY - "Boys, you've got it all wrong. The promises to Israel have been given to the Church. Israel has been replaced by the Church and God is finished with the literal nation of Israel!" (i) Before the Messiah came there would be a time of terrible tribulation. (ii) Into this chaos there would come Elijah as the forerunner and herald of the Messiah. (iii) Then there would enter the Messiah. (iv) The nations would ally themselves and gather themselves together against the champion of God. (v) The result would be the total destruction of these hostile powers. (vi) There would follow the renovation of Jerusalem. (vii) The Jews who were dispersed all over the world would be gathered into the city of the new Jerusalem. (viii) Palestine would be the centre of the world and the rest of the world subject to it. All the nations would be subdued. The disciples came to Him privately (cf Mt 17:19) - The Olivet Discourse was not a public teaching, but was given only for the ears of believers. Mark gives us the names of the four disciples who came to Jesus - "Peter and James and John and Andrew were questioning Him privately." (Mark 13:3) These were the first four disciples Jesus had called at the outset of His ministry and they comprised His innermost circle. Then the four disciples asked three questions. (1) When will these things happen? (2a) What will be the sign of Your coming? (2b) What will be the sign of the End of the Age? Parallel passages - Matthew 24:3; Mark 13:3-4; Luke 21:7 (Remember that to best understand Matthew 24-25, it is important to study the related passages in Mark and Luke). When will these things happen, and what will be the sign of Your coming and of the end of the age? - This is two questions with the second question having two components (some interpret it three questions - Walvoord, Fruchtenbaum - see below). Fruchtenbaum comments that "All together, three questions were asked which, at the same time, included requests for three signs." (Ibid) He explains that in the Luke passage the disciples asked not only when (just as in Matthew) but what is the sign that will identify that these things are about to take place. Matthew asks only when but do not mention a sign. What is the significance of the fact that there is only one article governing the coming and the consummation (end)? This suggests that the disciples viewed the coming and the consummation as two events which were distinct, but closely connected. This will be discussed more fully below. Tell us, when will these things happen - What are these things? This refers to the destruction of the Temple, which He had foretold in Mt 23:38 and again in Mt 24:2. The disciples did not ask "why" (presumably they understood why judgement had to come) but "when?" Indeed, if the disciples knew their OT prophecies, Jesus' prophecy regarding the Temple and His subsequent establishment of the Messianic Kingdom would have naturally led them to think of Zechariah 14:1-21, for Zechariah 14:2 describes a battle against Jerusalem, Zechariah 14:3,5 describes Messiah's victorious return (cp parousia - arrival and presence) and Zechariah 14:8-21 describes the conditions of the subsequent Messianic Kingdom. A few thoughts to ponder - Remember that in 2016 we read Jesus' prophecies almost 2000 years later and we know that the Temple has been destroyed in 70AD and we know that Jesus has not physically returned to bring this present age to its consummation and inaugurate His Messianic Kingdom. But if we place ourselves in the sandals of these four disciples on the mountain with Jesus, when they asked about the Temple destruction, they did not see a gap of 2000 years between the fulfillment of these prophecies (Temple destroyed, Jesus' arrival, end of this age). In their mind they clearly associated Jesus parousia (presence - see discussion below) and the consummation of the age (and beginning of the next, the Messianic Age). Indeed, from Acts 1:6 their question indicates that they thought the end of this age and the beginning of the Messianic Kingdom was to come soon, probably in their lifetime (cf Lk 19:11). After all they were on the same Mount of Olives as they were in Mt 24:3 when Jesus had first disclosed His prophecy. The difference was that now Jesus had been crucified and resurrected, returned to life from the dead. And they understood that truth now. And so here they were on the Mount and Jesus had indeed in one sense returned or "come" to them again (recalling that parousia means an arrival and a presence), this coming of course being from the grave not from clouds. And so one could easily see how they might interpret this as His parousia (arrival and presence) as fulfilled. No, the Temple had not yet been destroyed, but His coming back to life and coming to them would signal that this was the end of the age and soon the Messianic Kingdom would begin. Just a few thoughts to ponder! John MacArthur's sermon on The Signs of Christ's Coming, Part 1 gives a summary of first century Jewish eschatological expectations which helps us "get inside the disciples' heads" and better understand why they were asking Jesus what they asked. In other words, one might think that the mention of the Temple's destruction would generate a question related only to that topic. However they also asked about the coming of Messiah and the consummation of the age. It is clear that in their minds all three were related, but as alluded to above, they had no concept of the gap of time that would separate the Temple's destruction from the coming and consummation. See discussion of Time Gaps in Interpretation of Prophecy. In fairness, a number of commentaries feel that in Matthew 24 Jesus did answer the first question about when the destruction of the Temple would occur. These commentaries interpret Matthew 24:15-22 as a prophecy of the destruction of Jerusalem which was fulfilled in 70AD. The commentary you are reading however interprets the abomination of desolation in Mt 24:15ff literally and in light of Daniel 9:27-note as a prophecy of Jerusalem's destruction which is yet future. Matthew 24 and Mark 13 do not describe the destruction of Jerusalem in 70AD, although some who interpret it as yet future, also see either a past fulfillment ("double fulfillment") or a "type" or shadow of the yet future destruction. Luke 21:20-24-note presents a clear and distinctive sign (the Roman army surrounding Jerusalem) of the impending destruction of Jerusalem, which occurred in 70AD. It follows that both Matthew 24 and Mark 13 focus primarily on disciples' second and third questions regarding the timing of the Second Coming and the end of the age. The ending of the age? Yet people should not fear. And no one knows the hour. And by God's grace we stand. For you are serving me. What will be the sign of Your coming and of the end of the age? - As alluded to above the Greek construction clearly links these two events together. While the phrase Your coming naturally suggest Jesus Second Coming to most modern day readers. As discussed below the noun for coming (parousia) can have more than one meaning, so which meaning was intended by the disciples? Why did they ask Jesus about His coming? Had He just mentioned His coming? In fact He did in Mt 23:39 "For I say to you, from now on you shall not see Me until you say, 'BLESSED IS HE WHO COMES IN THE NAME OF THE LORD!'" And so He said that the Jews would not see Him again until they said "Blessed is He Who comes in the name of the Lord." And the END OF THE AGE refers to this current age that is going to usher in the corning of Jesus Christ. Coming (3952)(parousia) means presence, arrival, coming, an appearance, or a presence after having been gone. Parousia was used as a near technical term in secular Greek for the visit of a king or emperor or for the appearance of a god. (2) the arrival as the first state in presence - coming, advent. (a) Of human beings = Phil 1:26. (b) In a special technical sense referring to coming of Christ (1Cor 1:8, 2Th 2:8) and once to the coming of the Antichrist (2Th 2:9). Think about the disciples' request about His coming. What does that imply? Clearly it implies He would depart. Why would they think He was going to depart? If we examine the context, we note that Jesus did allude to His departure in Mt 23:39 stating "from now on you shall not see Me until you say, 'BLESSED IS HE WHO COMES IN THE NAME OF THE LORD!'" In other words, He predicts there is a time when Israel will not see Him. While the disciples may not have fully understood what He meant, the language clearly implies He would not be seen for a time and then He would be seen again ("until you say..."). Another passage the disciples may have had in mind was the Parable in Luke 19:11-15 where we see a "nobleman (~Jesus, Who) went to a distant country" and later "returned after receiving the kingdom." (Lk 19:15) This parable discusses the faithfulness of the nobleman's servants while he was absent. And finally as discussed above the disciples may have recalled Zechariah 14:1-21 which describes Messiah's return to rescue embattled Jerusalem (cp Zech 14:2-3, 4, 6). So the disciples were requesting a sign of His arrival/presence after departure or a sign of His future Second Coming, depending on which way they were using parousia. Most commentaries feel the disciples were referring to His future coming (but see Stedman and MacArthur below). Regardless of which way one interprets the disciples' question about His parousia, clearly Jesus used parousia to describe His future coming. The end of the age - Notice that KJV translates it as "the end of the world" but that is not an accurate translation for Matthew uses aion (age) not kosmos (world). In summary, by linking Jesus coming with the end the disciples probably believed that Jesus' coming would end the present age and bring in the Messianic Age. The Jewish people failed to recognize Jesus' mission to die as the Lamb of God Who takes away the sin of the world (Jn 1:29), and instead held fast to the hope that He would soon bring in an earthly Messianic Kingdom. While He did not come the first time to bring in the Messianic Kingdom (He would have if Israel had not rejected Him), His return would usher in His glorious kingdom. We see this truth echoed in other passages including ones from Matthew, Luke, Acts and even the OT prophet Daniel. (1) Matthew - In Matthew 19 Jesus had promised His disciples a place with Him in His future earthly kingdom. They just failed to grasp how far in the future this would be fulfilled! (2) Luke - Luke 19 records another passage that supports the premise that the Jews (including the disciples) were eagerly looking for the imminent appearing Messianic King and Kingdom. John MacArthur: Their anticipation was growing with each passing mile and is even suggested by the Greek verb translated appear, which is a nautical term for something becoming visible on the horizon (cf. Acts 21:3). But that earthly kingdom would be delayed, and Jesus would first be rejected by His people (John 1:11), killed, and raised from the dead to provide the sacrifice for salvation. At His return He will establish His earthly millennial rule (cf. Rev. 20:4-6). (3) Acts - It is notable that the very last question the disciples ask Jesus before His ascension was about the timing of the Messianic Kingdom. Comment: Notice that Jesus did not correct their belief but explained they the timing of "times or epochs" were in the hands of His Father. He did teach them that they had another mission which was to carry the Gospel to ends of the world. There is little doubt that some 40+ days earlier the disciples' question in Matthew 24:3 reflected their belief that Jesus was about to set up His earthly Messianic Kingdom. ESV Study Bible: The place of the disciples' assembly was the Mount of Olives (Acts 1:12), at the foot of which lay Bethany (Luke 24:50). The disciples asked Jesus when He would restore the kingdom to Israel because they concluded from His resurrection and the promise of the Spirit that the Messianic era had dawned and the final salvation of Israel was imminent. However, they were probably still expecting the restoration of a military and political kingdom that would drive out the Roman armies and restore national sovereignty to Israel, as had happened numerous times in the OT. Jesus corrected them, not by rejecting the question, but by telling them (Acts 1:8) that they would receive power from the Holy Spirit, not in order to triumph over Roman armies but to spread the good news of the gospel throughout the world. In other words, the return is in God's timing; in the meantime, there are other key things believers are to do. (4) Daniel - It is possible the disciples were familiar with Daniel's prophecies, including the prophecy in Daniel 2 which clearly linked Jesus' Second Coming (symbolized by the Stone) with the end of this age (The Stone will crush the statue representative of Gentile powers and Gentile dominion will come to an end when the Stone comes!) and the establishment of His Messianic Kingdom. The sign - Earlier Jesus has referred to the scribes and Pharisees who had asked for "a sign" as "an evil and adulterous generation." (Mt 12:38-39, cp Mt 16:1-4). He did not rebuke the disciples' request for a sign, for their request was not a manifestation of unbelief but of belief. They believed He was coming again and His coming would be associated with the end of the age. They wanted a warning sign regarding the coming events which they clearly believed would soon come to pass. "As for these things which you are looking at, the days will come in which there will not be left one stone upon another which will not be torn down." And they questioned Him, saying, "Teacher, when therefore will these things be? And what will be the sign when these things (What things? Lk 21:6 in context = utter destruction of the Temple) are about to take place?"" Note that the sign in Luke 21:20 is not the same as the sign in Mt 24:15. They are clearly distinctly different signs and to attempt to say they are identical signs is an example of not letting the plain sense of the Scriptures say what they say. The result of course will be an incorrect interpretation. To reiterate, Matthew 24 is indeed a difficult prophecy but the three signs are not difficult to identify unless one comes to the text with a preconceived bias or a desire to make Jesus' words fit one's particular system of theological interpretation. And if one fails to read the text literally, a difficult prophecy becomes even more difficult to accurately interpret! ** Events (2) and (3) are linked because the Second Coming marks the "end of the age" thus many writers say the disciples asked only two questions, the second having two components. The end of the age - KJV has "end of the world" but as Vincent says it is more correctly a reference to "the existing, current age," not to "the end of all time." So Jesus is not referring to the end of the world but the end of the age. The definite article is present signifying the specific age they were living in at the time. It is the same age we are living in today. The next age is the Messianic Age which of course identifies me as one who takes Scripture literally and believes in a coming time when Messiah rules and reigns on earth. The Messianic age will be followed by the next "age" of the New Heaven and New Earth. The End (Consummation) (4930)(sunteleia from sun = together or an intensifier + teleo = to finish) describes the bringing of something to a successful finish. In a word the noun sunteleia means completion, conclusion, close, end, consummation. It is used 5 times by Jesus Himself in the phrase the "end of the age." (Mt 13:39, 40, 49, 24:3, 28:20). The only other NT use is by the writer of Hebrews who describes "the consummation of the ages." (Heb 9:26). The end - This phrase occurs 9x/9v in Matthew's Gospel and 4 of the uses are in Matthew 24 (Mt 24:3, 6, 13, 14). Five times Matthew uses the specific phrase "the end of the age" and every time the noun for "end" is sunteleia. In the other 4 occurrences of "the end" the noun for "end" is telos. Matthew 10:22 "You will be hated by all because of My name, but it is the one who has endured to the end who will be saved. Matthew 13:39 and the enemy who sowed them is the devil, and the harvest is the end (sunteleia) of the age (aion) ; and the reapers are angels. 40 "So just as the tares are gathered up and burned with fire, so shall it be at the end (sunteleia) of the age (aion). Matthew 24:3 As He was sitting on the Mount of Olives, the disciples came to Him privately, saying, "Tell us, when will these things happen, and what will be the sign of Your coming, and of the end (sunteleia) of the age (aion)?" 13 "But the one who endures to the end, he will be saved. Matthew 28:20 teaching them to observe all that I commanded you; and lo, I am with you always, even to the end (sunteleia) of the age (aion)." Sign (4592)(semeion) (akin to semaino = to give a sign; sema = a sign) is a distinguishing mark or symbol that carries a special meaning or like a simple sign points to something else. In Scripture when semeion used of God's miraculous works (that which is contrary to the usual course of nature) it points to spiritual truth. Semeion can be a sign, a mark, a token, or a miracle with a spiritual end purpose. In other words a sign can be either natural or supernatural. A sign is an object, quality, or event whose presence or occurrence indicates the probable presence or occurrence of something else. In a number of NT contexts semeion takes on the sense of a miracle because of its unusual nature, especially as that which is contrary to the usual course of nature (e.g., Jn 2:23, Acts 4:16, 22 - And the KJV translates semeion as miracle 23x in John). Wiersbe says that a sign is "Something that points beyond itself to something greater. It was not enough for people to believe in Jesus' works; they had to believe in Him and in the Father who sent Him (John 5:14-24). This explains why Jesus often added a sermon to the miracle and in that sermon interpreted the sign. In John 5, the healing of the paralytic on the Sabbath opened the way for a message on His deity, "the Lord of the Sabbath." The feeding of the 5,000 (John 6) led naturally into a sermon on the Bread of Life." Semeion is found primarily in the Gospels and Acts with 17 uses in John, 13 in Acts, 9 in Matthew, 9 in Luke and 6 in Mark. Revelation uses semeion 7 times. The NASB translates semeion as follows = distinguishing mark (1), miracle (2), sign (35), signs (39). The KJV translates semeion much more frequently as miracle with the uses as follows = sign (50), miracle (23), wonder (3), token (1). Twice in Matthew Jesus answered the Jews request for signs declaring "An evil and adulterous generation craves for a sign; and yet no sign will be given to it but the sign of Jonah the prophet." (Mt 12:39, 16:4) He was referring of course to His resurrection as the sign of Jonah. In the uses of semeion by His disciples in Matthew 24, Mark 13 and Luke 21 there of course was no rebuke for they were not asking out of a heart of unbelief but of belief. In 2Th 3:17, of writing of the closing salutations, the apostle using the pen himself instead of his amanuensis, his autograph attesting the authenticity of his Epistles. MacArthur comments on use of semeion in the Revelation (Rev 12:1, 3; 13:13-14; 15:1; 16:14; 19:20) - Semeion (sign) describes a symbol that points to a reality. (Ed: Commenting specifically on the "sign" in Rev 12:1) The literal approach to interpreting Scripture allows for normal use of symbolic language, but understands that it points to a literal reality. In this case, the description plainly shows that the woman John saw was not an actual woman. Also, the reference to "the rest of her children," those "who keep the commandments of God and hold to the testimony of Jesus" (Rev 12:17), shows that this woman is a symbolic mother. Wayne Detzler - In the New Testament there are two Greek words which describe miracles. The first of these is semeion (literally "sign"). At first this word meant a visible sign which someone saw. For instance, when Constantine was embroiled in battle he saw the sign of a cross and the words, "In this sign conquer." This turned him to Christianity, and he granted toleration to the Christians in 313. So first of all semeion meant a real or imagined visible sign. Later it came to mean the intervention of the deities in our world. This is the meaning which the Bible attaches to miracles, when God breaks into the natural world to accomplish some special feat. A second word is thauma (which literally means "to wonder," or "to be astonished"). In this case the miracle is "in the eye of the beholder." The root word behind this Greek term is thea ("a vision"), or theaomai ("to contemplate"). It is seen in our English word "theater" (literally, "a place of seeing or viewing"). It is in this secondary meaning of astonishment that we see the root of a miracle. What causes one to be astonished or amazed is out of the ordinary. This was especially true in the Greek epic poems, which described many astonishing events. Thus thauma speaks of a "wonder," an amazing act, and thus a miracle....The most notable miracle-worker in the New Testament is, of course, the Lord Jesus Himself. It is He who raised Jairus' daughter from the dead (Matt. 9:18-26). He too interrupted the funeral procession at Nain (Luke 7:11-17). Having raised a little girl and a young man, He also brought His friend Lazarus back to life (John 11:38-44). (New Testament Words in Today's Language- - a useful resource for word studies - also in Logos). Trench on semeion - "It is involved and declared in the very word that the prime object and end of the miracle is to lead us to something out of and beyond itself: that, so to speak, it is a kind of finger-post of God, pointing for us to this: valuable, not so much for what it is, as for what it indicates of the grace and power of the doer, or of his immediate connection with a higher spiritual world"
See Trench's Analysis of the following synonyms. Note also: If you click on Strong's # you will retrieve the Abbreviated Thayer's Definition as well as the Expanded Thayer's [scroll down], the expanded Liddell-Scott-Jones definition, and Moulton-Milligan's (Vocabulary of the Greek New Testament) discussion. As an aside Polhill remarks that "It should be noted that "throughout Acts the term 'wonders' only occurs in conjunction with 'signs,' a testimony to the fact that mere marvels have no value in themselves except as they point beyond themselves to the divine power behind them and so lead to faith." In the plural, miracles which lead to something out of and beyond themselves; finger-marks of God, valuable not so much for what they are as for what they indicate of the grace and power of the Doer (Mk 16:20). (I) Particularly a sign by which something is designated, distinguished, known (Mt. 26:48; Ro. 4:11, circumcision as a sign [cf. Ge. 9:12, 13; 17:11]). Specifically a sign by which the character and truth of any person or thing is known, a token, proof (Lk 2:12; 2Cor. 12:12; 2Th 3:17; Sept.: 1Sa 14:10; 2Ki. 19:29; 20:8). (II) A sign by which the divine power in majesty is made known, a supernatural event or act, a token, wonder, or miracle by which the power and presence of God is manifested, either directly or through the agency of those whom He sends (Sept.: Ex. 4:8, 17, 28, 30). (A) As wrought of God (1Cor. 14:22), a token to the unbelieving of God's presence and power (cf. 1Cor 14:25); or perhaps a sign of divine displeasure (cf. 1Cor 14:21). "The sign of the prophet Jonah" means the miracle which God wrought in the case of Jonah concerning the great fish that swallowed him and the three days therein that followed (Mt. 12:39 [cf. Mt 12:40]; Mt. 16:4; Lk 11:29). Metonymically of persons sent from God, whose character and acts are a manifestation of the divine power (Lk 11:30). In Lk 2:34 for a sign which shall be spoken against. Of signs, wonders, miracles which God did through someone, joined with térata (5059), things out of the ordinary, wonders (Acts 2:22, 43; 4:30; 5:12; 14:3; 15:12). Specifically as revealing future events, a sign of future things, a portent, presage (Mt. 16:3), the miraculous events and deeds which reveal the coming of the Messiah in His kingdom (Mt. 24:3, 30; Mk 13:4; Lk 21:7, 11, 25; Acts 2:19; Rev. 12:1, 3; 15:1; Sept.: Deut. 13:1, 2). (B) Of signs, wonders, miracles wrought by Jesus and His Apostles and the prophets in proof and furtherance of their divine mission (Mt. 12:38, 39; 16:1, 4; Mk 8:11, 12; 16:17, 20; Lk 11:16, 29; 23:8; Acts 4:16, 22; 8:6; 1 Cor. 1:22). In John the word is used only in this sense (John 2:11, 18, 23; 3:2; 4:54; 6:2, 14, 26, 30; 7:31; 9:16; 10:41; 11:47; 12:18, 37; 20:30). Joined with térata, wonders, and dunamis (1411), mighty works (Jn 4:48; Acts 6:8; 7:36; 8:13; 14:3; Ro 15:19; 2 Cor. 12:12; Heb. 2:4). Hastings Dictionary - SIGN . Any outward fact which serves as a pledge of a Divine word or a proof of a Divine deed is a sign , whether it be natural or supernatural in its character. The rainbow served as the sign of the Noahic, as the rite of circumcision of the Abrahamic, covenant ( Genesis 9:12; Genesis 17:11 'token,' Romans 4:11). That God was with, and worked for, the Israelites was shown in the plagues of Egypt ( Exodus 10:2). Gideon asks for and receives a sign that it is Jehovah who speaks with him ( Judges 6:17), and Saul also receives signs to confirm the words of Samuel (1Sa 10:7 ). The prophetic word is thus proved from God ( Isaiah 7:14; Isaiah 38:7, Jeremiah 44:29, Ezekiel 14:8 ). The sign need not be supernatural ( 1 Samuel 2:34, Isaiah 8:18; Isaiah 20:3 ); but the Jews in the time of Christ desired miracles as proofs of Divine power ( Matthew 12:38; Matthew 16:1 , John 4:48 , 1 Corinthians 1:22), a request which Jesus refused and condemned. The message of the Baptist, though not confirmed by any sign, was seen to be true ( John 10:41 ). It is Jonah's preaching that is probably referred to when Jesus speaks of him as a sign to his generation ( Matthew 12:39 ). The 'babe wrapped in swaddling clothes, and lying in a manger,' is the simple and humble sign to the shepherds of the birth of a Saviour, Christ the Lord ( Luke 2:12 ); and He is welcomed by Simeon as 'a sign which is spoken against' ( Luke 2:34). The Fourth Gospel frequently describes the miracles of Jesus as signs ( Luke 3:2 , Luke 4:44), and attributes to them an evidential value which is not prominent in Jesus' own intention. This confirmation of the gospel was found in the Apostolic Church ( Mark 16:20 , Acts 4:16; Acts 6:3; Acts 8:6; Acts 8:13; Acts 15:12 , 2 Corinthians 12:12 ). The last things will be ushered in by extraordinary signs ( Matthew 24:30 , Luke 21:25 , 2 Thessalonians 2:9 the working of Satan with all power and signs and lying wonders, Revelation 12:1; Revelation 13:13 etc.). The faith that depends on signs, if not altogether condemned ( John 6:26 ), is by Jesus deprecated ( John 4:48 , cf. 1 Corinthians 1:22 ). 1. Signs function simply to identify. Judas' kiss clearly designated Jesus as the One the mob was seeking (Matthew 26:48 ). The sign of Jesus' coming and the end of the age which the disciples requested is, likewise, an identifying mark (Matthew 24:3; Mark 13:4; Luke 21:7 ); it is not a matter of evoking faith in Christ's coming but of identifying that event when it occurs. The difficult "sign of the Son of Man" is probably an identifying sign as well (Matthew 24:30 ). The above uses approximate the nontheological use of sign by the Old Testament. Other uses of sign are distinctly theological. 2. John's signs generally impart knowledge about Jesus and His relation to the Father. Jesus' first sign, the changing of water into wine at Cana, points to Jesus as the source of the abundant, joyful life which characterizes the anticipated Messianic Age (John 2:1-11 ). The three-fold repetition of the phrase "your son lives" in the healing of the official's son (John 4:46-54 ) points to Jesus as the life-giver. The healing of the sick man at the Sheep Gate Pool (John 5:2-9 ) points to Jesus as the One through whom God is still working (John 5:17 ). Though the just-fed crowd saw Jesus' feeding of the five thousand (John 6:2-13 ) as a sign that Jesus was a prophet (John 6:14 ), the sign points to Jesus as the life-giving bread which alone can satisfy (John 6:35 ). The sign of the healing of the man born blind (John 9:1-7 ) illustrates the ambiguity of signs: some took the sign to mean that Jesus was not from God; others, that God was with Him (John 9:16 ). John's conclusion (John 9:35-41 ) points to Jesus as both giver of spiritual insight and judge of spiritual blindness. Finally, the raising of Lazarus (John 11:1 ) points to Jesus as the resurrection and the life (John 11:25 ). 3 . Though the term sign is not used, the seal of God upon the foreheads of the redeemed (Revelation 9:4 ) is a sign of protection. 4. Some signs serve to motivate faith. The signs in the Fourth Gospel were recounted so "tha you may believe that Jesus is the Christ, the Son of the God, and that believing you may have life in His name" (John 20:31 ). John previously noted signs leading to faith (John 2:11; John 4:53; John 9:38 ). The sign of the healing of a lame man led to the praise of God in Acts 4:16 ,Acts 4:16,4:21 . Philip's signs, likewise, evoked the Samaritans' faith (Acts 8:6 ). 5 . Other signs serve to recall God's past saving acts. The paired expression "signs and wonders" (Acts 2:19 ,Acts 2:19,2:22; Acts 4:30; Acts 7:36-37; Acts 14:3 ) recalls the foundational saving events of the Exodus. The "signs and wonders" which Jesus and the apostles performed designate the inauguration of God's new saving event. 6. Paul spoke of circumcision as a witness to the covenant (Romans 4:11 ). 7 . Signs often serve as confirmation or authentication. The humble circumstances of the Christ-child in the manger confirmed the angel's announcement of a Savior to outcast shepherds (Luke 2:12 ). Jesus offered the difficult "sign of Jonah" as His authentication (Matthew 12:39-43; Luke 11:29-32 ). God was at work in Jesus' preaching of repentance as God had worked in Jonah. The New Testament often rebukes the demand for a sign to confirm God's work (Matthew 16:1; John 2:18; John 4:48; 1 Corinthians 1:22 ). A sign may evoke faith in a receptive heart, but no sign will convince the hard-hearted. The Sign of the Water Turned to Wine (John 2:1-11). The Sign of the Healing of the Nobleman's Son (John 4:46-54). The Sign of the Loaves and the Fishes (John 6:1-15). The Sign of the Walking on the Sea (John 6:16-24). The Sign of the Man Born Blind (John 9:1-17). The Sign of the Resurrection of Lazarus (John 11:33-47). The Sign of the Draught of Fishes (John 21:1-14). In the Book of Hebrews, we read the following: "God also bearing them witness, both with signs and wonders, and with divers miracles, and gifts of the Holy Ghost, according to His own will" (Heb. 2:4). Three things stand before us — miracles, wonders, and signs. These, in the Greek, are designated by three different words: "dunamis," power, significant of mighty works; "teras," wonder, significant of causing the people to marvel; "semeion," a sign, significant of a foreshadowing of Christ....."Semeion" is translated in John 13x by the word "miracle," and four times by the word "signs." (Ed Note: Neighbour is referring to the uses in the King James Version). The above notations show that there are three purposes in a miracle: first, it portrays the power of a Living Christ; second, it causes the people to wonder, and thirdly, it produces a sign, concerning the Lord Jesus Christ. The Gospel of John was distinctively written that "ye might believe that Jesus is the Christ, the Son of God; and that believing ye might have life through His name" (John 20:31). With one single exception, the Holy Spirit, in the Gospel of John, refers to the miracles of Christ under the word "semeion," a "sign." (Ed note: This statement is based on the KJV) The purpose of the Holy Spirit was to set forth distinctive marks of the Deity of Christ, that men might believe in Him and have life. Hampton Keathley - A miracle is an unusual and significant event (terasa) which requires the working of a supernatural agent (dunamis) and is performed for the purpose of authenticating the message or the messenger (semeion). Herbert Lockyer on "signs" (semeion) - Here we have a word carrying with it a particular reference to the significance of miracles as being seals by which God authenticated the miracle-worker himself. In semeion, the ethical purpose of the miracle is most prominent. A miracle was to be looked upon as a token and indication of the near presence and working of God and a proof of the genuineness of revelation. The miracles of Christ were signs and pledges of something more than beyond themselves (Isaiah 7:11; 38:7). As we have indicated, they were seals of power set to the person performing the miracle (Mark 6:30; Acts 14:3; Hebrews 2:4). They were legitimate acts whereby the miracle-worker could claim to be accepted as God's representative (I John 2:18; II Corinthians 12:12). The "signs" given to Saul, Eli, Gideon, and others are not to be thought of as miracles (I Samuel 10:1-19; Judges 7:9-15; Luke 2:12). Sign designates a proof or evidence furnished by one set of facts to the reality and genuineness of another" (II Corinthians 12:12). POWERS—Dunamis - Miracles are also "powers" in that they manifest the mighty power of God which was inherent in Christ Himself, "the great power of God" (Acts 8:10), and who was made unto us—power. This word points to new and higher forces working in this lower world of ours (Hebrews 6:5). Semeion refers to the final cause of miracles; dunamis, to their efficient cause. Semeion - 77x in 69v - NAS Usage: distinguishing mark (1), miracle (2), sign (35), signs (39). Matthew 12:38 Then some of the scribes and Pharisees said to Him, "Teacher, we want to see a sign from You." Matthew 16:1 The Pharisees and Sadducees came up, and testing Jesus, they asked Him to show them a sign from heaven. 3 "And in the morning, 'There will be a storm today, for the sky is red and threatening.' Do you know how to discern the appearance of the sky, but cannot discern the signs of the times? 4 "An evil and adulterous generation seeks after a sign; and a sign will not be given it, except the sign of Jonah." And He left them and went away. Matthew 24:3 As He was sitting on the Mount of Olives, the disciples came to Him privately, saying, "Tell us, when will these things happen, and what will be the sign of Your coming, and of the end of the age?" 30 "And then the sign of the Son of Man will appear in the sky, and then all the tribes of the earth will mourn, and they will see the SON OF MAN COMING ON THE CLOUDS OF THE SKY with power and great glory. Matthew 26:48 Now he who was betraying Him gave them a sign, saying, "Whomever I kiss, He is the one; seize Him." 12 Sighing deeply in His spirit, He said, "Why does this generation seek for a sign? Truly I say to you, no sign will be given to this generation." Mark 13:4 "Tell us, when will these things be, and what will be the sign when all these things are going to be fulfilled?" 20 And they went out and preached everywhere, while the Lord worked with them, and confirmed the word by the signs that followed. [And they promptly reported all these instructions to Peter and his companions. And after that, Jesus Himself sent out through them from east to west the sacred and imperishable proclamation of eternal salvation. Luke 2:12 "This will be a sign for you: you will find a baby wrapped in cloths and lying in a manger." Luke 11:16 Others, to test Him, were demanding of Him a sign from heaven. 29 As the crowds were increasing, He began to say, "This generation is a wicked generation; it seeks for a sign, and yet no sign will be given to it but the sign of Jonah. 30 "For just as Jonah became a sign to the Ninevites, so will the Son of Man be to this generation. Luke 21:7 They questioned Him, saying, "Teacher, when therefore will these things happen? And what will be the sign when these things are about to take place?" Luke 23:8 Now Herod was very glad when he saw Jesus; for he had wanted to see Him for a long time, because he had been hearing about Him and was hoping to see some sign performed by Him. John 2:11 This beginning of His signs Jesus did in Cana of Galilee, and manifested His glory, and His disciples believed in Him. 23 Now when He was in Jerusalem at the Passover, during the feast, many believed in His name, observing His signs which He was doing. John 3:2 this man came to Jesus by night and said to Him, "Rabbi, we know that You have come from God as a teacher; for no one can do these signs that You do unless God is with him." John 4:48 So Jesus said to him, "Unless you people see signs and wonders, you simply will not believe." John 6:2 A large crowd followed Him, because they saw the signs which He was performing on those who were sick. 14 Therefore when the people saw the sign which He had performed, they said, "This is truly the Prophet who is to come into the world." 30 So they said to Him, "What then do You do for a sign, so that we may see, and believe You? What work do You perform? John 7:31 But many of the crowd believed in Him; and they were saying, "When the Christ comes, He will not perform more signs than those which this man has, will He?" John 9:16 Therefore some of the Pharisees were saying, "This man is not from God, because He does not keep the Sabbath." But others were saying, "How can a man who is a sinner perform such signs?" And there was a division among them. John 11:47 Therefore the chief priests and the Pharisees convened a council, and were saying, "What are we doing? For this man is performing many signs. John 12:18 For this reason also the people went and met Him, because they heard that He had performed this sign. 37 But though He had performed so many signs before them, yet they were not believing in Him. Acts 2:19 'AND I WILL GRANT WONDERS IN THE SKY ABOVE AND SIGNS ON THE EARTH BELOW, BLOOD, AND FIRE, AND VAPOR OF SMOKE. Acts 4:16 saying, "What shall we do with these men? For the fact that a noteworthy miracle has taken place through them is apparent to all who live in Jerusalem, and we cannot deny it. 22 for the man was more than forty years old on whom this miracle of healing had been performed. Acts 5:12 At the hands of the apostles many signs and wonders were taking place among the people; and they were all with one accord in Solomon's portico. Acts 6:8 And Stephen, full of grace and power, was performing great wonders and signs among the people. Acts 7:36 "This man led them out, performing wonders and signs in the land of Egypt and in the Red Sea and in the wilderness for forty years. Acts 8:6 The crowds with one accord were giving attention to what was said by Philip, as they heard and saw the signs which he was performing. Acts 15:12 All the people kept silent, and they were listening to Barnabas and Paul as they were relating what signs and wonders God had done through them among the Gentiles. Romans 15:19 in the power of signs and wonders, in the power of the Spirit; so that from Jerusalem and round about as far as Illyricum I have fully preached the gospel of Christ. 1 Corinthians 14:22 So then tongues are for a sign, not to those who believe but to unbelievers; but prophecy is for a sign, not to unbelievers but to those who believe. 2 Thessalonians 3:17 I, Paul, write this greeting with my own hand, and this is a distinguishing mark in every letter; this is the way I write. Revelation 13:13 He performs great signs, so that he even makes fire come down out of heaven to the earth in the presence of men. Revelation 15:1 Then I saw another sign in heaven, great and marvelous, seven angels who had seven plagues, which are the last, because in them the wrath of God is finished. Revelation 16:14 for they are spirits of demons, performing signs, which go out to the kings of the whole world, to gather them together for the war of the great day of God, the Almighty. Revelation 19:20 And the beast was seized, and with him the false prophet who performed the signs in his presence, by which he deceived those who had received the mark of the beast and those who worshiped his image; these two were thrown alive into the lake of fire which burns with brimstone. Genesis 4:15 So the LORD said to him, "Therefore whoever kills Cain, vengeance will be taken on him sevenfold." And the LORD appointed a sign for Cain, lest anyone finding him should slay him. Genesis 9:12-13) And God said, "This is the sign of the covenant which I am making between Me and you and every living creature that is with you, for all successive generations; 13 I set My bow in the cloud, and it shall be for a sign of a covenant between Me and the earth. Genesis 9:17 And God said to Noah, "This is the sign of the covenant which I have established between Me and all flesh that is on the earth." Genesis 17:11 "And you shall be circumcised in the flesh of your foreskin; and it shall be the sign of the covenant between Me and you. Exodus 3:12 And He said, "Certainly I will be with you, and this shall be the sign to you that it is I who have sent you: when you have brought the people out of Egypt, you shall worship God at this mountain." Exodus 4:8-9"And it shall come about that if they will not believe you or heed the witness of the first sign, they may believe the witness of the last sign. 9 "But it shall be that if they will not believe even these two signs or heed what you say, then you shall take some water from the Nile and pour it on the dry ground; and the water which you take from the Nile will become blood on the dry ground."